Slow cooker posole is an easy version of authentic Mexican posole–or stew–made with pork, hominy, onions, garlic, plus all the traditional toppings. The only thing missing is the constant need to tend it on the stovetop. 1. Preheat a 5- to 6-quart slow cooker on high until warm, about 20 minutes. Season pork with salt. 2. In a large skillet set over medium-high heat, warm 1 tablespoon oil. Add the pork to the skillet and cook until the pieces are browned on all sides, about 8 minutes. Transfer to the slow cooker. 3. In the same skillet, reduce the heat to medium-low and heat 1 tablespoon oil. Add the onion, garlic, and chili powder and sauté until softened, about 6 minutes. Add 2 cups broth and cook, stirring and scraping up browned bits with a wooden spoon. Transfer everything in the skillet to the slow cooker along with 2 cups broth. Cover and cook until the meat is very tender, 4 hours on high or 8 hours on low. 4. Using tongs or a slotted spoon, transfer the pork to a large bowl and, using 2 forks, shred the pork. Return the pork to the slow cooker and stir in the hominy. Stir to combine and to warm the pork. Season with salt to taste. 5. Serve the posole with avocado, radishes, tortilla strips, and lime on the side for each person to add as desired. 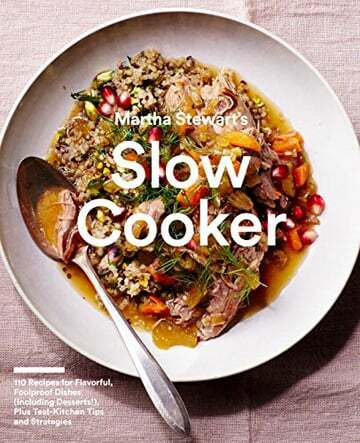 Slow Cooker Posole Recipe © 2017 Editors of Martha Stewart Living. Photo © 2017 Stephen Kent-Johnson. All rights reserved. All recipes and photos used with permission of the publisher.